Enough of the sweet stuff. I am exploring chocolate’s savoury side, this week. I think it has to do with me being fascinated with chocolate’s roots, before the sugar was added, and those fascinating people: the Mayans and the Aztecs. Like the earlier Mayans, who mixed cacao with water, chili peppers, cornmeal, and other ingredients, and poured it back and forth between vessels to produce a foamy, spicy chocolate drink, the Aztecs also consumed a bitter chocolate drink seasoned with spices, as refined sugar was not available to the ancient Mesoamericans. Well, perhaps this beverage is not quite the thing to tingle modern North American taste buds, but also from the Aztec Nahuatl language comes mole – by definition, a muddle or concoction. Mole is a type of delicious, spicy sauce, usually flavoured with chilis, and while chocolate is not an essential ingredient to some types, it is often found in mole recipes. 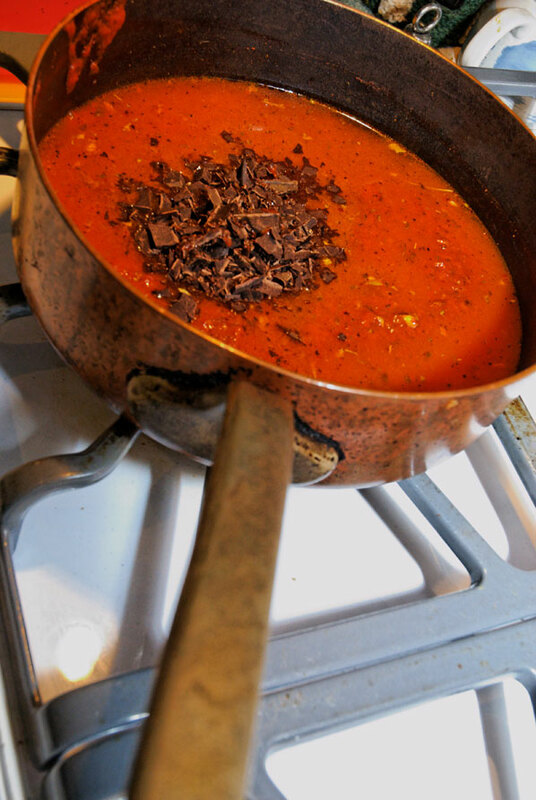 The addition of unsweetened chocolate works to tame the heat of the chilis and spices, and helps to give the sauce its dark colour, as well as providing a rich hint of flavour, without overtaking the sauce. 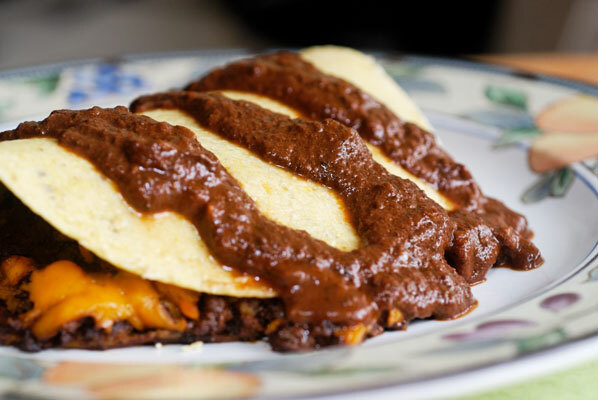 My family are huge fans of chicken enchiladas, so I was delighted to discover a plethora of enchilada recipes, incorporating chocolate into the sauce. This is the one I tried out the other day, substituting for the chocolate chips requested in the recipe, a good chunk of quality unsweetened chocolate. While I assemble the ingredients for the mole, I am trying to remember the exact wording of a quote I heard, when a woman from Mexico wrote in to the BBC, who were doing a piece about the ‘traditional Christmas dinner’. She wanted to remind them that both the turkey and the chocolate actually came from the New World, and that folks in Mexico were eating them as part of their ‘traditional Christmas Dinner’ too – “We just eat them together”. The aromas of the sautéing spices have drawn my younger son, sniffing, into the kitchen, and he is now very much intrigued and looking forward to the “chocolate chicken” we will be having for dinner. Quite a few steps, and a good chunk of simmering time allows me to consider other savoury chocolate dishes. Another easy appetizer recipe, this one has the added benefit of allowing Ecole Chocolat students to practice their tempering skills, as the basis for it is a perfect sheet of tempered bittersweet chocolate, cut into squares. Maybe it is because I love chocolate cheesecake, but I find this absolutely delicious – especially the chives! Even cheese is finding a home in rich cacao, pleasing consumers with a sweet and savory combination. “Goat cheese truffles have become some of my customers’ favorite purchases,” notes Cheryl Robbins-Dooley, owner of Blackflower Chocolates, Shelburne, Vt., which offers fresh truffles with local goat, Camembert and mascarpone cheese. After having sampled Shawn Askinosie’s excellent white chocolate, made with goat’s milk, last week, I can speak to how well the tanginess of goat’s milk compliments the unctuous silkiness of cocoa butter. The sides of my tongue are still tingling! Munching nibs—the meat of the cacao bean, hulled, cracked and toasted—is as in vogue as sipping designer water. And the crunchy treats are being paired with some unexpected ingredients that give new meaning to the term bittersweet. For instance, in its new single origin Exotic Candy Bar line, Vosges marries espresso, chicory root and nibs for its 70 percent Creole Bar, while sherry vinegar and Spanish paprika can be found in Blackflower’s chocolates. Scharffen Berger Chocolate Maker, Berkeley, Calif., offers a fresh confection line featuring Nibs Nougatine, a signature truffle that combines crunchy caramelized cacao nibs with chocolate ganache, enrobed in dark chocolate. The cacao bean itself is a growing treat. Austin, Tex.-based Cocoa Puro offers Kakawa, a whole-roasted, chocolate-covered cocoa bean dusted with cocoa powder. Unlike a nib, Kakawa is the whole bean and packs a bold crunch with maximum chocolate flavor and texture. “It is the taste of real chocolate,” says Owner Tom Pedersen, who first introduced his beans at a downtown Austin farmers market one year ago. Pedersen knew he had something good when he sold out of the first 15 pounds in less than an hour. 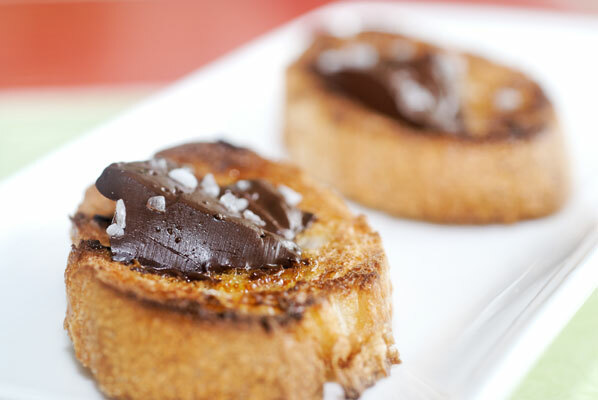 The beans can also be used to garnish cakes. My own dear husband is a huge fan of roasted cocoa beans, which he eats straight out of the bag. I pull the enchiladas from the oven, we inhale the mixture of spices, garlic, and chocolate and we dive in. The rich mole sauce adds an almost meaty taste to the dish – the dark chocolate ensuring that the spices are carried to all corners of the mouth. One of our sons really doesn’t like the taste of tomatoes, and while this mole has pureed tomatoes in it, their flavour is, I believe, muted by the chocolate. 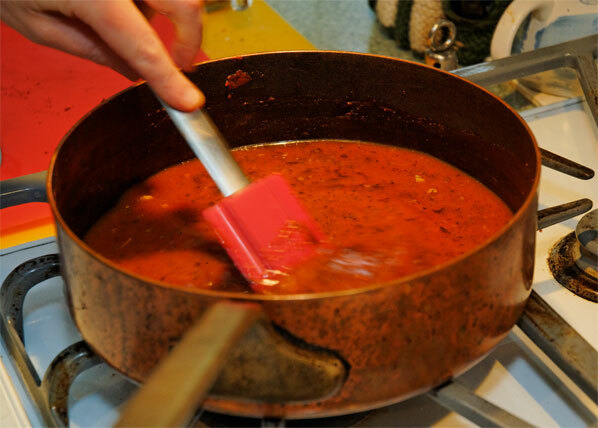 It is very rich, and it is then that I realize I have used twice as much mole sauce as I should have – as I had cut the enchilada servings down from eight to four, to fit our family. Oops. Nonetheless, they are delicious, and this dish has received the APPROVED rating from my family of taste testers (no mean feat). Perhaps this craving for things chocolate but not sweet, can be explained by chocolate’s complexity. Just as fine wine can be sweet or very dry, or a good cheese, vinegar or olive oil can be fruity, our passion for chocolate is not so much about sweetness, but the way it makes us feel, through all the senses: smell, melting mouth feel, taste and even the sight of a glossy bar or dark puddle of it, makes the salivary glands spring into overdrive. Which is happening for me, right now. Good thing I know where The Good Stuff is hidden.